Project Assistant (2) Biology @ TIFR-HBCSE,Mumbai. Executive Consultant, Student Academic Office AcSIR, NCL,Pune. AcSIR – Dr. APJ Abdul Kalam Summer Training Program 2016. Like people, cockroaches like to hang out together, especially when they have nothing else to do. Now, researchers know why. Gut bacteria pooped along with their feces emit odors that the roaches find attractive. When those bacteria are missing, cockroaches tend to go it alone, researchers have discovered. Gut microbes in other organisms may likewise influence behavior in ways we have yet to appreciate. “We don’t know whether microbes are generally important in mediating chemical communications, but my best guess is that it’s widespread,” says Angela Douglas, who studies microbes and their animal hosts at Cornell University and was not involved with the work. Eavesdropping on microbe-cockroach conversations could lead to better ways to control this common household pest. Insects typically communicate using odors called pheromones; those that attract males to females are well-studied. Since the 1970s, entomologists have also known that so-called aggregation pheromones encourage roaches to stick close to one another. But researchers never could agree on what those pheromones really are. Some suggested they were waxy substances in the outer skin; others argued they were nitrogen-rich compounds in the feces; and a third group insisted that fatty acids—building blocks for fat—were involved, although which ones exactly was under debate. Coby Schal, an entomologist at North Carolina State University (NC State) in Raleigh wondered whether the conflicting results meant that different cockroaches depend on different aggregation chemicals because of variation in their environments, food, or gut microbes. So Schal and his team, including NC State entomologist Ayako Wada-Katsumata sterilized German cockroaches, Blattella germanica, and raised them in germ-free cages, so their feces would be germ-free. Usually cockroaches are attracted to their neighbors’ feces, but they tended to avoid the germ-free stuff. About 80% to 100% of young cockroaches tested preferred feces over sterile water, and although the difference in attraction was not as clear-cut between extracts of germ-free and normal feces, there were significantly more cockroaches aggregating by the normal feces extract, the researchers report online today in the Proceedings of the National Academy of Sciences. Without the microbes in the feces, the cockroaches no longer banded together very much. “The aggregation properties decline tremendously,” Schal says. When Wada-Katsumata isolated feces bacteria and fed them to the germ-free cockroaches, the roaches once again tended to form groups. Sophisticated chemical analyses of normal roach poop and germ-free poop showed that the latter lacked many of the usual fatty acids that evaporate from the feces once it is exposed to air; the researchers conclude these volatile fatty acids may be the missing aggregation pheromones. Synthetic versions of these compounds also cause cockroaches to aggregate. “This study explains how different studies in the past have yielded different results,” Douglas says. “It all depends on the microorganisms.” This may be why fatty acid advocates couldn’t agree on which fatty acids were important. Schal says that other candidate aggregation substances, in high concentrations, also seem to help bring the insects together, but these bacteria-produced compounds are much more potent and may be the most important drivers, Coby says. Other researchers have shown that a specific microbe hosted by desert locusts helps induce crowding behavior in that species. And in 2012, researchers suggested that bacteria living in hyenas’ scent glands impart the odors that help these animals tell kin from nonkin or pick out group members. “There’s the potential for this to be widespread,” Schal says. And how about people? What we eat affects the bacteria in our guts, which in turn can affect what we smell like. But although the resulting foul body odor may deter contact, “there’s no evidence the bacteria play a positive role in communication among humans,” Schal says. It is a constant challenge for instructors to develop novel approaches of pedagogy, especially for introductory biology (Bio101) for the first year undergraduate students. Every year about 200 students are admitted into the five-year Integrated B.S/M.S program of IISER, out of which at least 60% of the students have not studied biology at their high school level, while the rest of the students have studied advanced biology. It is therefore a formidable task for the instructors to keep students engaged in class and interested in biology. Reasonably well-structured course content with periodic evaluation serve as useful indicators of the level of comprehension of biology by students from diverse backgrounds. As a test case, we considered a novel approach for students to build models to represent any biological process or phenomenon as a part of their continuous evaluation instead of the usual quiz and exams for the first time at IISER Pune. There were no pre-conditions in terms of selecting topics. However, an important criterion was to ensure cost effectiveness and ecofriendliness in terms of concept and design of the models. The class of 200 students was sub-divided into smaller groups of 10 students each. Each group sent in a title and abstract of the model that they intended to prepare. Needless to mention, the momentum of building novel models built up closer to the deadline. A palpable sense of excitement prevailed on the morning of the exhibition. All students arrived early to set up their models. Amazingly, models ranged from demonstrating fundamental concepts of evolution from evolutionary bottlenecks to cell division, motor protein function, image formation on the retina, nerve impulse conduction and many more. What was particularly striking was the extent of innovation and simplicity that each model brought forth, using simple hand crafted material from paper and Styrofoam. Students also unleashed their artistic potential. This event underscored that even students not initiated or interested in biology were extremely motivated scientists to apply their skills across disciplines from math, physics and chemistry in devising novel approaches to demonstrate fundamental concepts in biology. A distinct advantage with first year students is their unbridled and unfettered thoughts that translated into action. Students were truly excited to discuss the science and the concept behind each of the models that they had created. 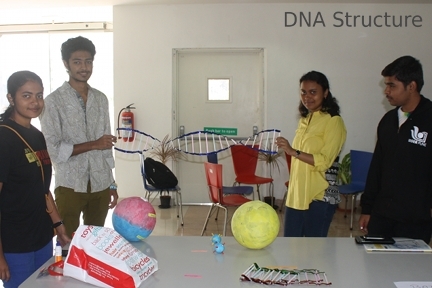 For instance, a group created a model demonstrating protein synthesis from a strand of mRNA as template. Remarkably, the model was fashioned out of a cardboard box, with a strip of paper representing mRNA with the codons indicated. Pushing the paper through one end of the box spewed out a chain of styrofoam balls from the other end depicting protein synthesis! A simple demonstration clarified a fundamental concept and any amount of lectures wouldn’t help drive home this concept as well. Another elegant model demonstrated reflex action. A simple battery operated circuit with a live wire flinched instantly when brought closer to water. All in all this event was truly a learning experience for the instructors as much it was for the students, since this highlighted the fact that students really do not need constant spoon-feeding and leaving themselves from time to time goes a long way in harnessing their latent talent creativity, and curiosity. Original News : IISER,Pune News. The Asian elephant joins the ever-growing list of animals with sequenced genomes. Recent analyses throws light on the genetic bases of evolution in these intelligent, social animals. Researchers at the Indian Institute of Science Education and Research (IISER) Pune and the Indian Institute of Science (IISc) Bangalore have analyzed the genome and transcriptome sequences of an Asian elephant in their report to be published in the December issue of the Journal of Biosciences. India is home to the largest population of the Asian elephant, Elephas maximus, an endangered species with less than 50,000 individuals remaining in the wild. The Asian and the African elephants are the largest living land mammals; have a shared evolutionary history dating back about 7 million years ago, yet exhibit species-specific differences. Most of the research on elephants so far has been focused on themes such as ecology, behavior, demography, reproductive biology, welfare and conservation. However, there have been very few studies on understanding the genetic bases of evolutionarily important traits and processes. This study demonstrates the power of next generation sequencing and comparative genomics and transcriptomics in the study of functional genetics in a non-model species. By sequencing the genome of the Asian Elephant, the team has identified more than 1500 genes that set it apart from its African counterpart. One of the most significant subset of these genes were found to be involved in olfaction (the sense of smell), and possibly indicate an evolutionary adaptation to differences in the chemical signals that the Asian elephant lineage encountered after it moved out of Africa. The team has also reported and analyzed the first transcriptome sequence from blood lymphocytes in the Asian elephant. Proteins with domain architectures unique to elephants in comparison with three other related species of the superorder Afrotheria were identified in this study. This study offers a foundation upon which future research could be directed towards studying evolutionary relationships trait-/species-specific evolutionary processes both within the elephantids, as well as between elephants and other mammals. This paper titled “Comparative sequence analyses of genome and transcriptome reveal novel transcripts and variants in the Asian elephant Elephas maximus” was authored by Reddy PC, Sinha I, Kelkar A, Habib F, Pradhan SJ, Sukumar R and Galande S. and has appeared in the Journal of Biosciences this week.